In Part 2, we covered many of the feelings your child or teen may not be able to express in words. a) Children and teens expect their parents to always be there. b) Due to your own grieving, you’re often emotionally unavailable to them. c) Your child may be afraid of showing distress out of fear of further distressing you. d) Children and teens often feel that their peers and some adults treat them differently because of the death. Others can, in fact, be uncertain how to react to grieving children and teens under these circumstances. Your child needs you to help find the words to express the pain. Make the time to ask your child his or her views about what has happened. Listen to his or her thoughts about death. Correct false thinking but be sure to listen and give them an opportunity to ask questions. It’s important to give clear, truthful answers about what happened. Trusted family and neighbors can be invaluable at a time when you’re so overwhelmed by taking on some of your childcare responsibilities. IMPORTANT: Do not create the expectation that your child or teen has to take the place of your spouse in any way. This is especially important with older children and teens, who are often able to assume chores like cooking, housework, or driving. Check out our post, Online Support for Grieving Kids and Teens for helpful resources. In the first part of three excerpts from Lost My Partner – What’ll I Do? Revised and Expanded Edition, we talked about how children and teens demonstrate their grief differently than adults do. In Part 3, we’ll look at how loss has impacted your child’s world and the best ways to be supportive. In Part 2 of this excerpt from Lost My Partner - What'll I Do? 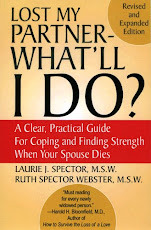 Revised and Expanded Edition, we provide some ways to cope with the often conflicting emotions that can arise when your late partner has died due to his or her decisions. It's important to keep in mind that your partner exercised a choice and ultimately was the only one to have the power to act on that choice. Because it’s common for family members to blame the surviving partner for either contributing to or not preventing the death, it’s helpful to talk through your reactions with supportive people outside your family. Due to some of the above issues, your mourning experience may be more complicated. Try to trust your own instincts about what is right for you and seek supportive counseling to help sort through possibly conflicting and confusing feelings about your loss. If your partner’s death occurred as an apparent result of not following medical advice and/or complying with treatment or by substance abuse, it can seem that he/she chose to die. While the term “suicide” is generally applied to a sudden act that results in death, these situations can seem like a form of slow suicide. After what may have been years of frustration as you tried your best to control your partner’s self-destructive behavior, he/she died anyway. As a consequence, you may see yourself as not having been valuable or powerful enough to stop your partner’s downward spiral. You may also feel “relieved” that a painful and oppressive relationship has ended, but guilty about expressing this, especially around family and friends, who may see your reactions as “disloyal” towards your late partner. In Part 2, we'll offer tips on how to cope with these concerns. Daily life is full of things that go wrong or break down. The refrigerator goes on the blink. The car needs new brakes. Or the plumbing creates a disaster. 1)Prioritize. Which tasks are most urgent? What can wait a while? 2)Get support. Although you may be very capable under normal circumstances, this is not a “normal” time for you. For now, it’s okay to ask family, friends and neighbors for assistance. 3)Give yourself permission to make a mistake. If you later find that you didn’t make the best decision to solve a problem, be kind to yourself. Remind yourself that you’re going through one of life’s most stressful experiences. At least you did something to handle a problem. Remember: For now, your usual coping abilities are not working as they used to. This is only temporary! You will get better. The last surviving veteran of any particular war, upon his or her death, marks the end of a historic era. Exactly who is the last surviving veteran is often an issue of contention, especially with records from long-ago wars. The "last man standing" was often very young at the time of enlistment and in many cases had lied about his age to gain entry into the service, which confuses matters further. The last surviving veteran may have been Daniel F. Bakeman, who was placed on the pension rolls by an act of U.S. Congress and is listed as the last survivor of the military conflict by the United States Department of Veterans' Affairs. According to a 1918 report in 1869 there were 887 widows of Revolutionary war Veterans on the pension list. On November 11, 1906 the last Revolutionary War widow Esther Sumner Damon of Plymouth, Vermont, died at age 96; reportedly, a few surviving daughters of American Revolutionary War Veterans were later pensioned by Special Acts of Congress. Hope you have a Happy Fourth!